It is extremely rare that a « mother forgotten » (birth mother) leaves a farewell letter to her baby. 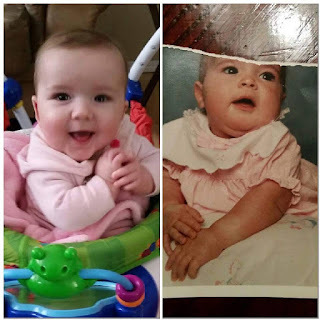 The document published here thanks to Ashley Jacobs and Ilona, her biological mom. This document has a historical value that exceeds the intimate lives of these two women, whom we thank. Abandoning a child is an act often difficult to understand. We can not really understand what was the life of those, who had to separate from their child. What are the circumstances that led them to this difficult decision? For many people, women who abandon their children are devoid of maternal instinct or human sensitivity. But does anyone really think that? Are not these people confronted with complex life choices? Ashley Jacobs was born June 19, 1990 in Craiova in Romania. At birth, she called Irina. 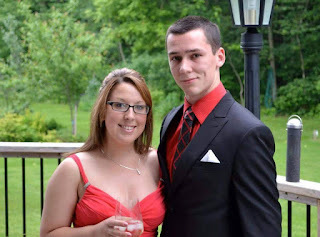 She was 6 months old when his parents gave her to the adoption to a Canadian couple from Toronto. Despite a very happy childhood with her adoptive parents, she always felt the need to know who gave him life. At 12 year old she began alone, by herself to research on the internet. 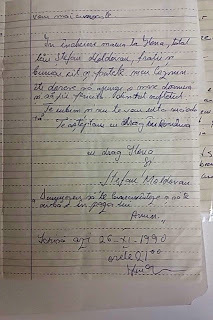 The envelope contained some photos and a handwritten letter dated 26 November 1990 : this meant that the letter was written three days after the adoptive mom of Ashley will be made at the home of her Romanian parents. The place which she left in taking Ashley, for the country was to become her own, Canada. In the beginning of this letter we would like you to know that it is written by your mother and father, those parents that brought you to life and wished only the best for you. 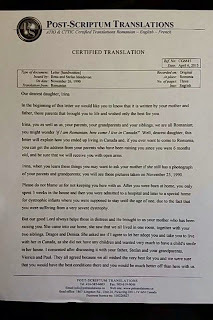 Irina, you as well as us, your parents, your grandparents and your siblings, we are all Romanian; you might wonder ‘if I am Romanian, how come I live in Canada?’ Well, dearest daughter, this letter will explain how you ended up living in Canada and, if you ever want to come to Romania, you can get the address from your parents who have been raising you since you were 6 months old, and be sure that we will receive you with open arms. 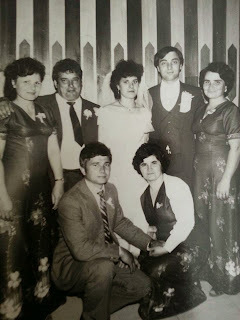 Irina, when you learn these things you may want to ask your mother if she still has a photograph of your parents and grandparents; you will see those pictures taken on November 23, 1990. Please do not blame us for not keeping you here with us. After you were born at home, you only spent 3 weeks in the house and then you were admitted to a hospital and later to a special home for dystrophic infants where you were supposed to stay until the age of one, due the fact that you were suffering from a very severe dystrophy. But our good Lord always helps those in distress and He brought to us your mother who has been raising you. She came into our home, she saw that we all lived in one room, together with your two siblings, Dragos and Denisa. She asked me if I agree to let her adopt you and take you to live with her in Canada, as she did not have any children and wanted very much to have a child’s smile in her house. I consented after discussing it with your father, Stefan and your grandparents, Viorica and Paul. They all agreed because we all wished the very best for you and we were sure that you would have the best conditions there and you would be much better off than here with us. My darling, please rest assured we were very sorry to let you go away, but in Romania we did not have the means to treat you, there was no medication and we were very poor. Irina, please ask Michelle to tell you what our condition was when she visited us together with her sister-in-law, Patricia, and then how they were received at the home of your grandparents who are wonderful people. From the bottom of our hearts we would love if you could come to Romania and meet your brother and sister, your mother and father, as well as your grandparents. We hope you are as beautiful as you were when you left. Please understand our decision as we only wished the best for you and we are hoping you are doing well. Both your grandparents and we wanted you become a grand lady, and when you come visit us please tell us who you are because we might not recognize your face anymore. 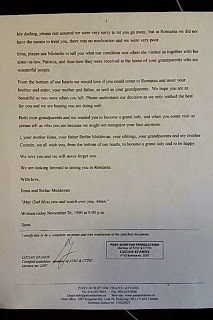 I, you mother Ilona, your father Stefan Moldovan, your siblings, your grandparents and my brother Cozmin, we all wish you, from the bottom of our hearts, to become a grand lady and to be happy. We love you and we will never forget you. We are looking forward to seeing you in Romania. 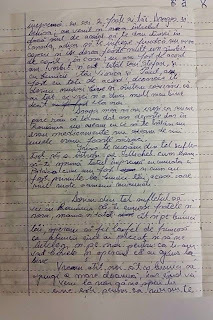 Written totay November 26, 1990 at 9:00 p.m.
As soon adopted Irina who had become Ashley has benefited in Canada for medical treatment that allowed him to heal disease in Romania his biological parents did not have the ability to heal. 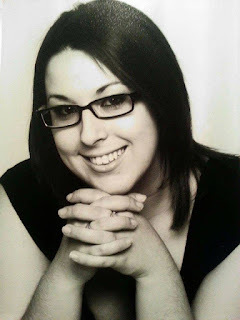 After reading the letter she had tried to write them to the address that had kept her adoptive parents, but had no response and resumed his research on the internet. « Mom, Dad, my dear family if you can not get in touch with me, I understand that. I know that thank you. Thank you gave me life that I could not have in Romania, thank you for allowing me thus to be a healthy and happy child. I know that I grew up in a happy home, a loving family and I could not and I did not have as to have a life more beautiful than that. So, your wish has come true. I hope you will be able to find in this article. If you agree with this, I can not wait to meet you. The next day his parents found this message on the newspaper and immediately contacted her. It was there just one month, Ashley has accomplished her dream and that of Ilona. “I searched for my mother for 12 years (half of my life) and finally found her. I believe a mother’s love conquers all and gives you the power to stay strong even when you are at your weakest. The love of my adoptive mother (Michelle) and my biological mother together kept me going when all other hope was lost. The main message i want to get across today is that a mother’s love has no boundaries. No stopping point- and I believe we’ve proved that very well. Don’t forget all that your mother has done for and take the time to appreciate the struggles she has been through and the sacrifices she’s made to keep you happy and healthy. with thanks to Ashley .Jacobs, Ilona Moldovan & Ileana Cuniffe. 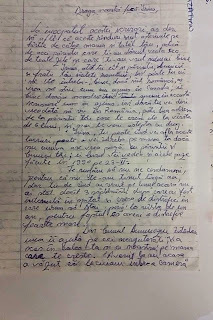 Cette entrée a été publiée dans Témoignages et étiqueté 1990, adoptés, Adoption Roumanie, birth mother, Canada, Craiova, Famille, letter, lettre, mother's day, Recherche, retrouvé mes parents biologiques, Roumanie, Témoignages, Toronto, Traduction, Translation. Sauvegarder le permalien.